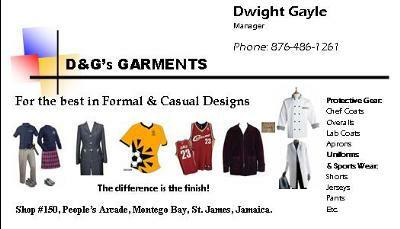 D&G Garments and Tailoring is one of the top small tailoring establishment in Montego Bay, Jamaica, offering the best in both casual and formal designs. We also specialize in protective wear and sports wear. We are also sought for the best in sportswear including football shorts, jerseys and pants. Our office is located at Shop #150, People’s Arcade, Montego Bay, St. James, Jamaica. And if you can't make it to us, we'll come to you! Just give us a call at. We are proud to say that we have supplied some of the top businesses in Montego Bay and surrounding areas with uniforms and protective clothing. These include both hotels and football clubs. By the way, tell us you found on on the internet and you'll get a special discount!! Our contact numbers are 876-486-1261 and 876-872-4111. We open from Monday to Friday, 8:30AM to 6:00pm. D&G’S GARMENTS & TAILORING - The difference is the finish! You can try them...I have they're really good! Both formal and semi-formal wear....Especially tailored suit for women. Its made to fit.